We are well on our way into October, and you may be thinking, “Just get me to November 20th,” but us Jabberjays are ready to soak up the fun of our annual Hunger Games Costume Contest! This year we are upping our game by taking the costume contest to the next level. First, we are asking you to suit up like you fell straight out of Panem. Second, we want you to recreate and film your favorite THG scene by using the Dubsmash app. So don’t just dress the part, BECOME your favorite character for a chance to win two free Fandango movie tickets to see Mockingjay Part II! Need some inspiration? Check out our own staffer, Grant’s, Dubsmash videos. “Grant”ed he didn’t dress up, they are still pretty amazing/hilarious. All entries must have a very clear Hunger Games theme. 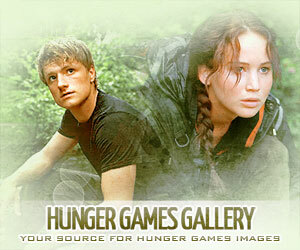 The staff of Jabberjays.net reserves the right to strike any entry if the theme is deemed not relating to The Hunger Games. One Dubsmash video is required for entry, although multiple entries will be accepted. 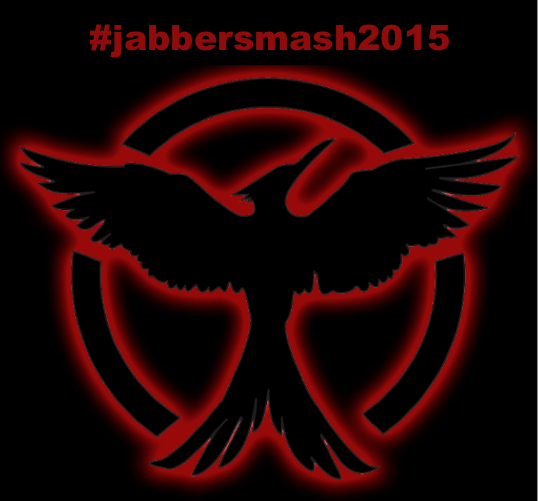 Please submit a clearly lit, high quality Dubsmash video on Instagram (which may later be displayed on our site) and make sure to use @jabberjaysnet with the hashtag #jabbersmash2015. The video must portray a reenactment of any Hunger Games scene (from any of the first three movies) through the use of the Dubsmash app. Dubsmash video submissions need to be 10-15 seconds. Less is okay, but videos exceeding 15 seconds will be subject to disqualification. We totally take filming creativity into account! Please include a description of your Hunger Games costume’s theme. DEADLINE: Entries must be submitted by midnight ET on October 31, 2015 (midnight on Halloween night). Due to the prizes available (two Fandango tickets to see The Hunger Games: Mockingjay Part 2), only US contestants are eligible to win. 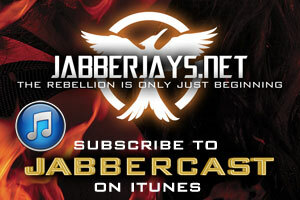 However, non-US participants are encouraged to enter and could receive recognition on our website, Jabberjays.net. By entering this THG Costume+Dubsmash contest, you are granting Jabberjays.net the right to post your photo or video on our website. Have someone else take your video or keep camera very still, such as on a tripod or propped up on something. Do not submit very low quality videos as this can hurt the amount of points you are awarded by judges and will also prevent us from properly showcasing your contest entry on social media. If we can’t see it, we can’t judge very well! To get an idea of what we are looking for costume-wise, check out the winning submissions from last year’s Costume Couture Contest and Pumpkin Carving Contest.